I would like to purchase a copy. May I know where I can order? which internet bookstore? or directly form you? Yes, I can have it xeroxed, or better photo-copied, –(parts are already done)– and then market it as a cd for cost plus mailing, this first volume of Daoist Mijue (Dokyo Hiketsu,道教秘訣 in Japanese) is only a portion of the materials in the as yet unpublished Zhuang-lin collection. I hope to have a complete set done soon, the original 25 volume Zhuanglin Xu Daozang, 莊林續道臧and the 2nd series of Mijue ben 道教秘訣集成。Many have asked for these collections, including Wudangshan, and Daoist organizations from SE Asia. Will let you know as soon as it is ready, hopefully in June. The original edition of Dokyo Hiketsu Shusei seems to be out of print, as was selling for a whopping 30,000 yen, which is now over $310 US. This is an outrageous price, and since I have the original (photocopied) documents, I am in the process of publishing a new, updated, far more complete edition. The reson why these documents are important is because they represent the teachings of the 3 mountains, Mao Shan, Longhu Shan, and Wudangshan (as well as Gezao Shan when it was operating), since the Sing dyanasy reformation. These documents are not give to scholars who do not “practice” Laozi Ch. 67 (kind heart, frugal life stile, never put self over others), and also are not given to those who practice or promote “fangzhong”. The monastic tradition is of course celibate, and the “fire dwelling” married Daoists are required to live morally upright lives, according to p. 33a of the “# Mtn Drop of Blood Alliance” ordination manual. Thanks very much Prof. Saso. I’m a taoist myself, researching Way of Celestial Master teachings for a research paper. I’m a student of Prof. Lai Chi Tim. I’m both Zhengyi and Chuan Zeng ordained taoists in HK – fire dwelling. Being a female aged 40, I don’t practice ‘fangzong’. I’m single. I’m a decent banker working in HK. I don’t smoke, non-alcholic, no gambling and no drugs. I consider myself following Laozhi’s teachings at all times. I would like to study your work purely for academic purpose. I am planning to take up PHD studies and I would like to study Way of Celestial Master rituals. 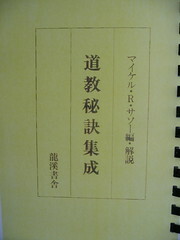 I have read some parts of your 莊林續道臧 and intriued by what is stated there. Perhaps you know that Prof Lai specialize his studies in ritual field. I therefore woudl liek to follow you as well as his footsteps to contribute to this area. You mentioned June, but I may likely miss the deadline of submitting my research outline for applying PHD. May I know what timeline you are looking at such that I can plan accrodingly? In case if the publish date can’t make it before my deadline, would you suggest that I direct purchase a copy from you? I just found your website. Wonderful information! I am sure you get asked about these books and other resources quite often. Please forgive me for being another person to ask you about these, but are these 道教秘訣, 莊林續道臧, and the 2nd series of Mijue ben 道教秘訣集成 available to the public yet? I am planning on starting a Chinese literature MA soon and hope to study Daoist literature. Any of the mijue manuals would make for interesting reading and study! With gratitude and blessings to you! Thank you for your query, Zoe, both of the works mentioned are ready to order, with oraclebones Press, the on-line availability will have to wait until my return to Los Angeles, at the end of November, please contact me through my regular e-mail michael_saso@yahoo.com to get copies before they are posted as available on this site. Thanks for the response. Looking forward to ordering these in a few days!